Your Face on an Action Figure? We Have a Contest Winner! Home » ACTION FIGURES & MERCH » Your Face on an Action Figure? We Have a Contest Winner! Was it you … ? … it was if your name is LUKE FEDER. Luke won our most recent contest, with the folks from MyFaceOnAFigure.com — and now he gets to have his face on an action figure in a 2-pack with one of Figures Toy Company‘s Batman figures! Luke was one of the people selected at random who correctly answered the question: In what month did the Batman TV series starring Adam West premiere on ABC Television? I live on Long Island with my wife and daughter and teach full-time for a college in Brooklyn. I came of age as a comics fan in the early ’90s, but stopped collecting for many years. Even during this period, though, I kept reading trade paperbacks, especially Batman trades like Frank Miller’s Year One and Jeph Leob’s The Long Halloween. I’m that guy who in his 30s has fallen back in love with comics. 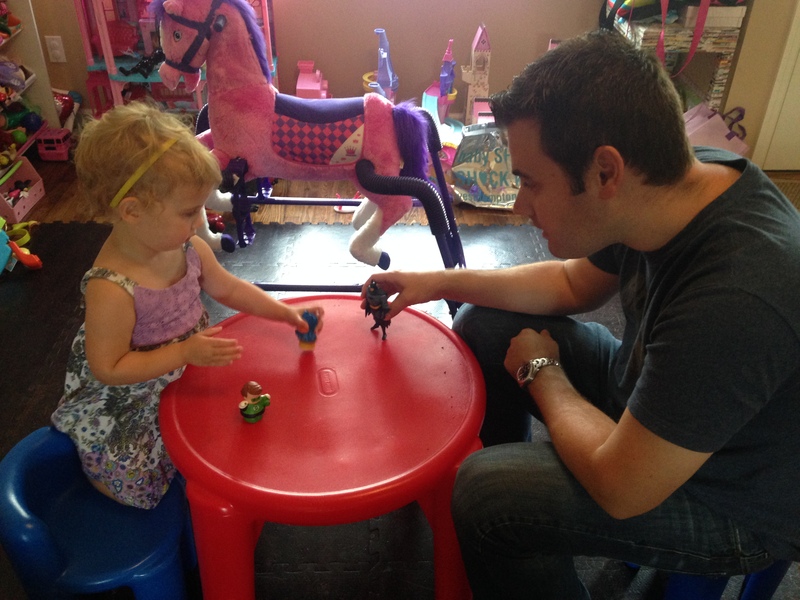 I think fatherhood has reawakened the kid in me — not that comics are kids’ stuff. I’ve really enjoyed introducing my daughter to shows like Ultimate Spider-Man, Batman: The Animated Series, and even Batman ’66, which in addition to her princess shows, she loves. I’ve always been drawn to Batman. I find him more relatable as a superhero. He actually doesn’t have a superpower other than his superior intellect as the world’s greatest detective, and athleticism. He could exist! I also appreciate the darker, grittier tone of the Batman books. At the moment, I’m on a big 1970s Batman kick — in particular, the Denny O’Neil and Neal Adams books. As a child of the ’80s, my toy collection mostly consisted of He-Man and G. I. Joe figures. I did have a Mego Spider-Man, but I destroyed the outfit and got rid of it, not realizing that years later I probably could have gotten a replacement outfit. 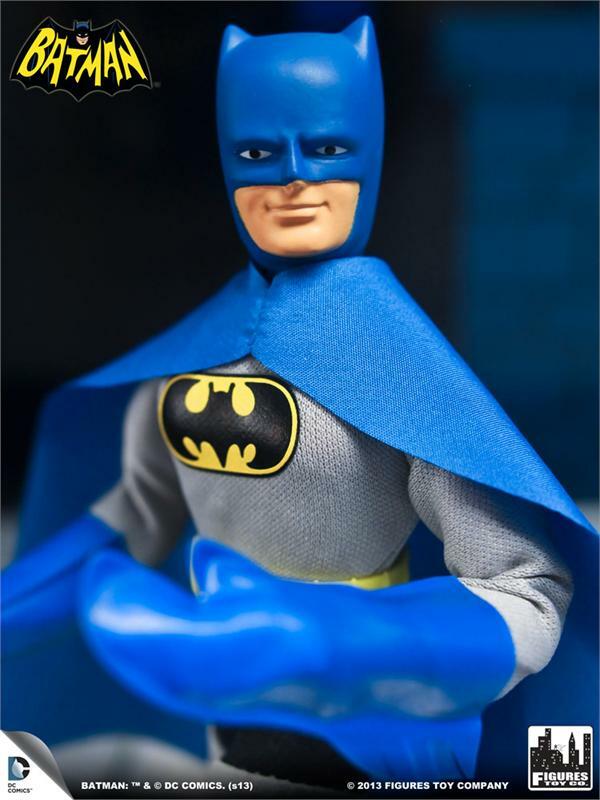 I always keep an eye out at local flea markets for a reasonably priced Mego Batman. CONGRATULATIONS, LUKE! You’re a man after our own Bat-hearts! 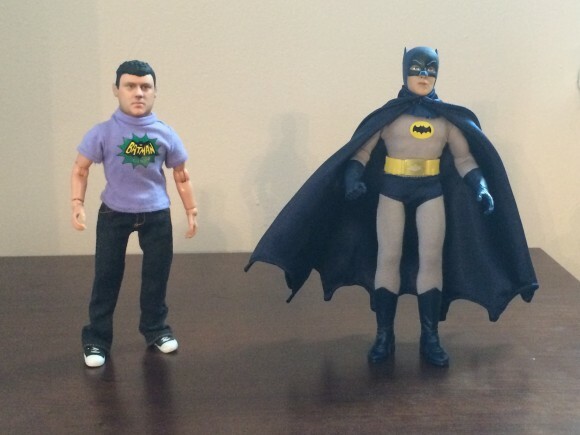 By the way, here’s me with Adam West Batman. Luke has a lot to look forward to! And don’t worry if you didn’t win — we have plenty of other contests to come!